Chad Dukes at some point suggested that critics might argue the word itself is offensive, regardless of how the Redskins have used it. “Show me how the Redskins themselves–not the name–show me how the representation of the name Redskins in the WASHINGTON Redskins has ANY negative connotation,” Bostic requested. “ANY negative connotation, any small part of a negative connotation. Show me any part of that. And if you will, I’ll be more than glad to listen to you…. 1a) Since when does a corporation get to dictate to people how they should feel about an issue? People have their opinions and team owner Dan Snyder has his--both according to the First Amendment. If Snyder or Bostic doesn't like the criticism, he can get the hell out of America. 1b) The public has a right to weigh in on Snyder's business because the public makes that business possible. Through our government, we give the Redskins an antitrust exemption, trademark protection, stadium subsidies, use of the airwaves, etc., etc. Not to mention the public benefits all corporations get: roads, utilities, police protection, etc. If Snyder wants to operate a truly private business, he can forswear all of these government handouts and operate on his own. Until then, this welfare recipient can take our opinions along with our charity. 2a) "Show me how the Redskins themselves–not the name...," Bostic begins. But why the hell should we exclude the problems with the name? Because Bostic is a quivering coward who doesn't want address the actual argument of mascot foes? Dukes already offered the obvious rejoinder. It doesn't matter how the team uses the name because the name itself is offensive to many Indians. It's defined in many dictionaries as an ethnic slur or vulgarism. In almost every case where a person, race or ethnic group is defined according to a bodily characteristic, it is offensive to the group to be objectified and identified with the name of that physical characteristic, even when the physical characteristic would seem to be a positive one! For instance, if someone is big and muscular, and if they are called "muscle head" they would consider it offensive. Or if they are short, and if they are referred to by others as "shorty", then it is considered offensive. Let's say the person is very tall, and everyone calls them "stretch", the person may learn to resent it because it does not recognize their proper name. People want to be called by their proper names, not nicknames. People want to be identified and understood according to the content of their character, not the bodily-characteristic nickname. It is a simple matter of respect Mr. Bostic! Don't reduce entire races or classes of people to a characteristic of their bodies. Human beings ask for more respect than that given by the name "redskin. 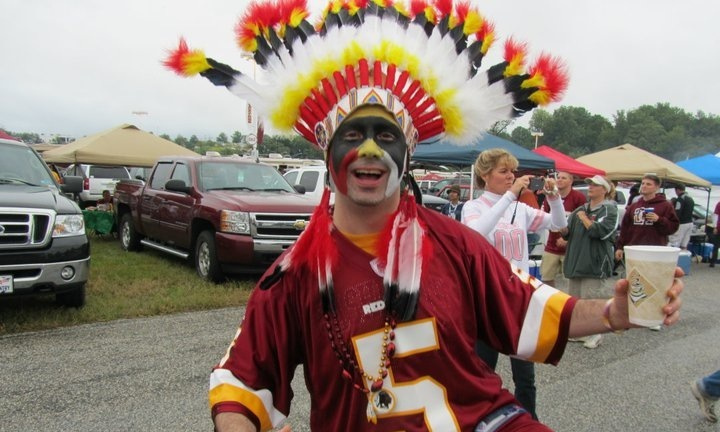 "A positive nickname might be okay, but the evidence that "Redskins" has negative connotations is voluminous. See the trademark lawsuit against the Redskins for more on the volumes of evidence. 2b) Perhaps sensing that he's on shaky ground, Bostic switches from "prove 'Redskins' is offensive" to "prove the team has done something offensive." Nice try to weasel out of your position, Bostic. We addressed your first claim, and now we'll address your fallback claim. Until the team banishes this activity anywhere on its property, it's tolerating it. And the team is more than tolerating the band and Chief Zee; it's sanctioning them. There you go, Jeff. The Redskins' official and unofficial message is that all Indians are the same; all are primitive people of the past. If you're ignorant about racism, singling out one race for this kind of stereotyping is the epitome of it. Duh. Any questions? Now that we've explained the facts to you, will you change your position? No, of course not. You're a white man who benefits from subordinating other races...'nuff said. For more on the Washington Redskins, see AP Poll on Redskins Is Flawed and "Inuit Chief" Supports Washington Redskins. "You're a white man who benefits from subordinating other races." This one didn't need the bordering-on-racist comment at the end... it was excellent overall. The white reference, of course, is undermined by the photos. Non-white fans are as enthusiastic about the team/mascot/name as whites are.